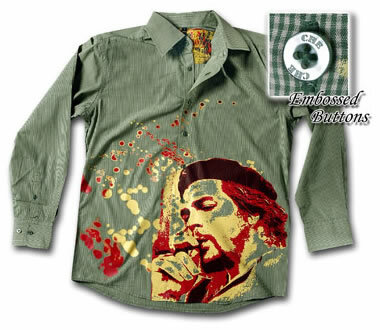 Men's long sleeve, olive green, heavyweight, button-down club shirt with colourful image of Che smoking a cigar in browns, yellows and reds, and "CHE" ebmossed on buttons. This is an end run shirt, so order it before it is gone! Fabric is specially made with microfibre. Available in small to 3x-large (3XL).